Since Bachalo has to skip every other arc, we are treated to Victor Ibbanez’s art. Cerebra has dropped the X-Men off in a mysterious location. We know it must be dangerous if Illyana is excited about the prospects of the place. 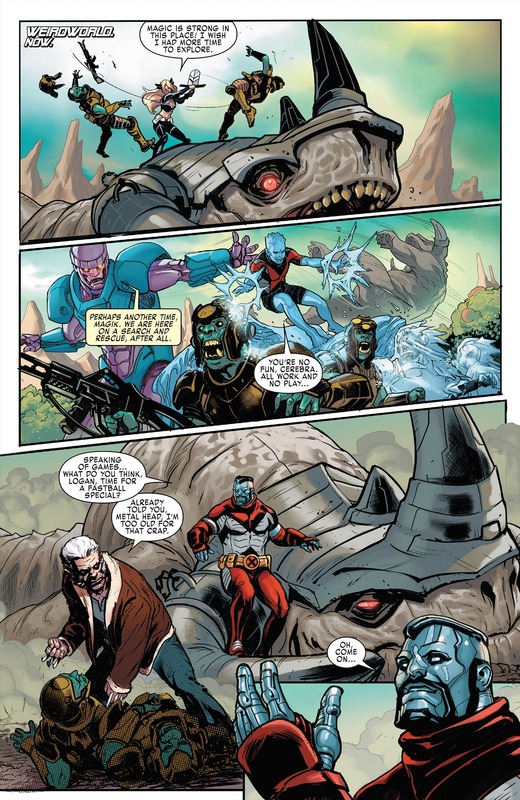 Iceman has named the threat, Rhinosaurs! 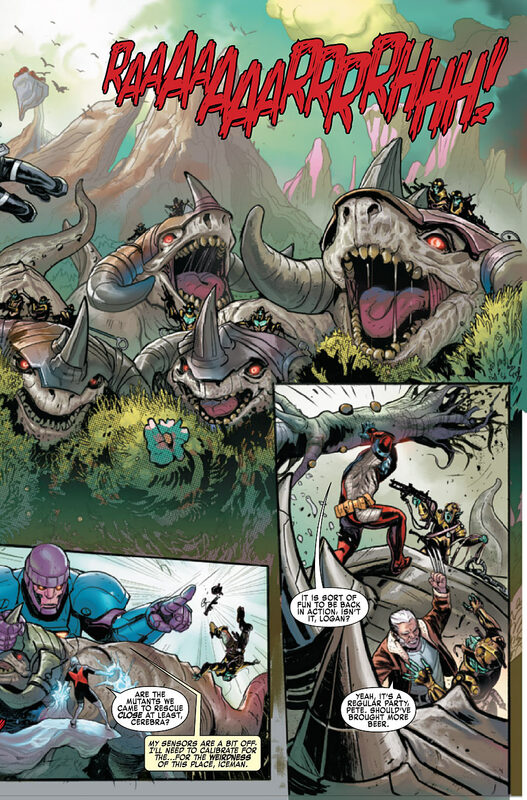 WeirdWorld is one crazy place. 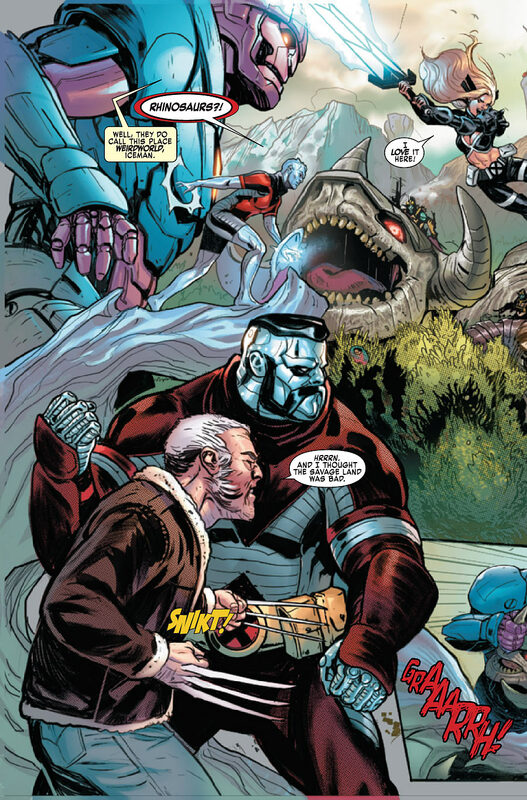 Colossus is trying to get into the fun with Old Man Logan, but the older man isn’t giving in. X-Haven. Five Hours Earlier. Old Man Logan is enjoying real beer but Iceman doesn’t know if he should be drinking in front of the students. Which is silly as the students are living in a demon infested realm. 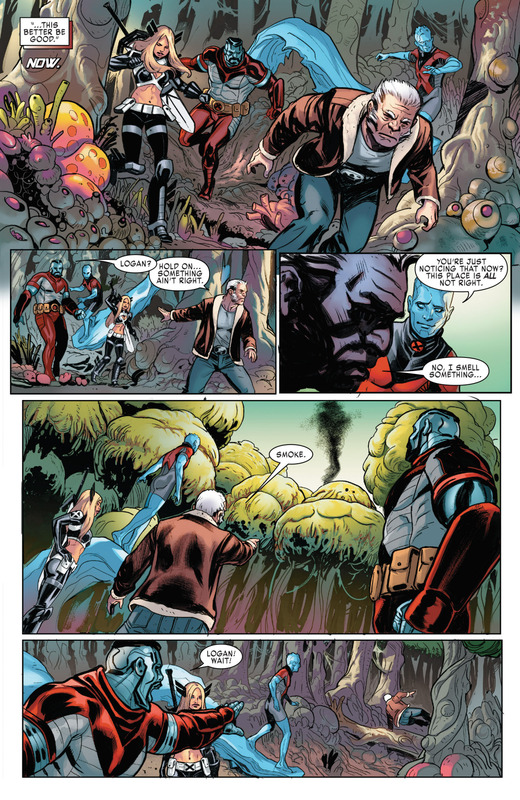 The two are with Storm, Forge and Teen Jean as they look in on Colossus talking to Nightcrawler. Forge reveals that he was able to reattach Kurt’s tail but his mind isn’t back yet. Jean hasn’t invaded Kurt’s mind, which is crazy mature of her. Storm wants to try the friendship route with Colossus, first. Kurt looks so haggard. Tired and haggard. 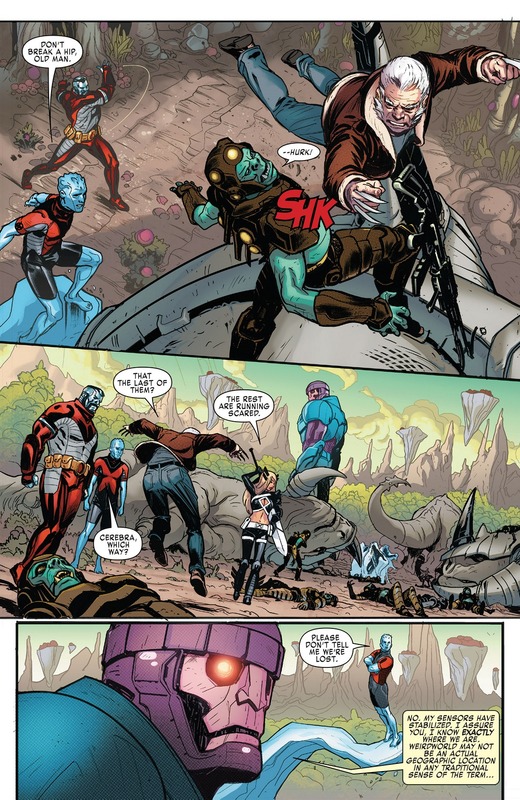 Anole, Glob Herman and Ernst arrive to see how beloved X-Man, Nightcrawler, is dong. Glob greets Jean but she walks away, Old Man Logan has his non-transparent eyes on Glob. Colossus comes out of the room and tells Storm that Kurt is completely lost. Storm recommends he give up on his oldest friend and take on a new student to watch over. Seems overly harsh to me. 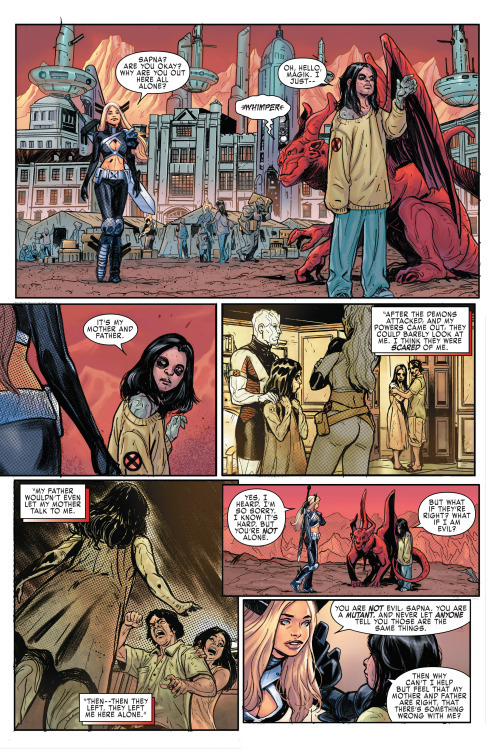 This segues us to Illyana guiding a new student. Magik is checking on Sapna, the Demon Whisperer. Her parents are a tad scared of her, which comes at the price of having powers that help you commune with demons. It isn’t a family friendly power. Her parents are gone now, as bigots are not allowed at X-Haven, I hope. Illyana can relate to Sapna, as their powers could put them in the evil category but they rise above that noise. 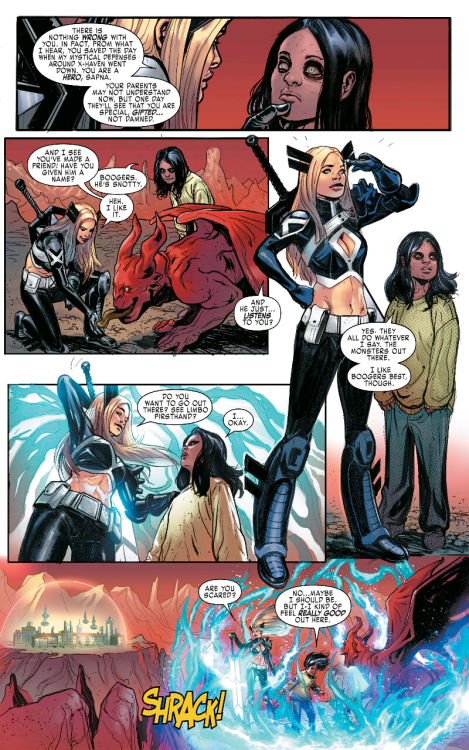 Illyana gets to make a pretty nice speech, telling Sapna that she is a hero not a damned person. Sapna has a friend in Illyana but also an awesome new demon pet she named, Boogers. He’s snotty, which could be overly cute but I sort of dig it. This sets up repeating what Sapna’s power is. Magik teleports the three of them to Limbo proper, which Sapna feels pretty comfortable with. I really like Illyana making a new friend, she’s due for another one. Plus, her other friend is guarding the universe so they are not keeping in touch as much these days. Sapna apparently can see the doors to the other realms. Illyana is the master of this realm but not the others – which this would be pretty great if this series broadens Magik’s power base. Weirdworld. Now. Magik is still having a blast. She wants to come back, which I would totally buy an issue of that series, if she appeared in an issue. Colossus, who clearly has been wanting to throw Old Man Logan, for a while. I can see him constantly bringing it up in situations that don’t quite match. It really is the only thing the two have in common. Old Man Logan finally gives in and I imagine gets a headache and a nose bleed. They have been fighting blue fellas. Two Hours Ago. Ernst, Martha, Anole and Glob are not pleased. Colossus tells them to shape up but seriously, there are not malls and they only have the school buildings. Unless they want to venture out into Limbo but that doesn’t seem like a good idea. Especially with Anole, who probably hates being in Limbo as a constant reminder of how he lost his one arm. They want to go on real missions, so Colossus is going to start training them. If they want to go on the Search and Rescue missions, they need to be properly trained. Iceman arrives, wanting to talk to Anole. As the two gay characters would have to have a moment. Where is Northstar at, these days? Anole has heard of Teen Bobby coming out of the closest but he hasn’t heard about adult Iceman’s coming out. Iceman came out to his younger self and teen Jean but now he’s telling Anole. Anole is so comfortable with who he is, so it makes sense. 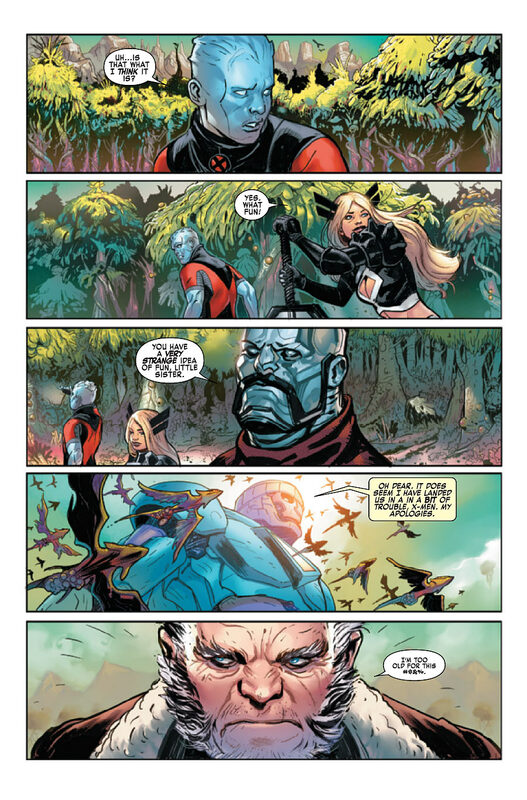 I do like the younger Anole helping the older Iceman – hopefully future scenes don’t feel forced. Sapna can feel the energies of the realms on the other side of the portals. Some are good but more are bad, real bad. Magik wants to enlist Doctor Strange, another series I would like to own more issues of. 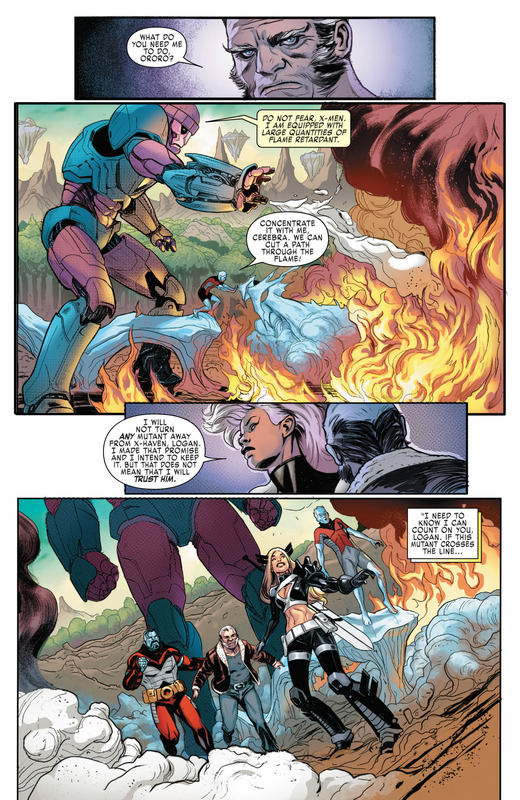 Storm breaks up the momentum by summoning the X-Men. I want to learn more about these other realms. Could this branch out to a Magik ongoing? That would be great. Now. Old Man Logan smells smoke. Iceman isn’t thrilled to be facing fire – he’s fine with Rhinosaurs and goblins. One Hour Ago. Storm is explaining how a plane from Asia got lost and landed in Weirdworld. Old Man Logan has heard of this place. Jean isn’t on the mission, as she is going to help Kurt. 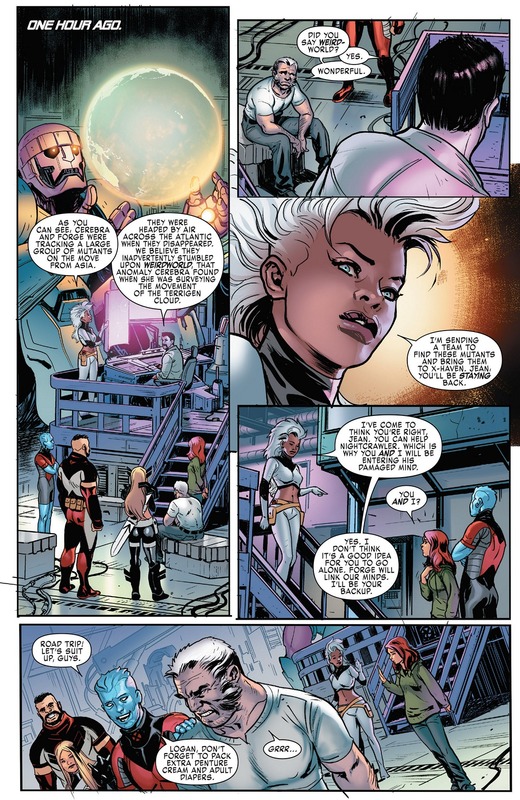 Storm and Jean are going to do that ol’ enter the brain trick – which is typically fun. Old Man Logan isn’t thrilled with all of Iceman’s elderly jokes. He’s probably wishing he can slice into him but he knows he won’t stop at just Iceman. Does Old Man Logan and Miles Morales know what happened during Secret Wars 2015? They have to answer that question eventually, right? Storm pulls Old Man Logan aside. Storm doesn’t want Forge to hear the conversation and tells him to leave. Storm not so subtly tells Forge that they are not going to be like how they use to be. Storm knows who they are going after and warns Old Man Logan. This person is very dangerous and sided with Cyclops when Cyclops did the thing that he did that got himself killed. Storm won’t turn any mutants away but she won’t trust any of them, blindly. That mutant is . . . Sunfire! 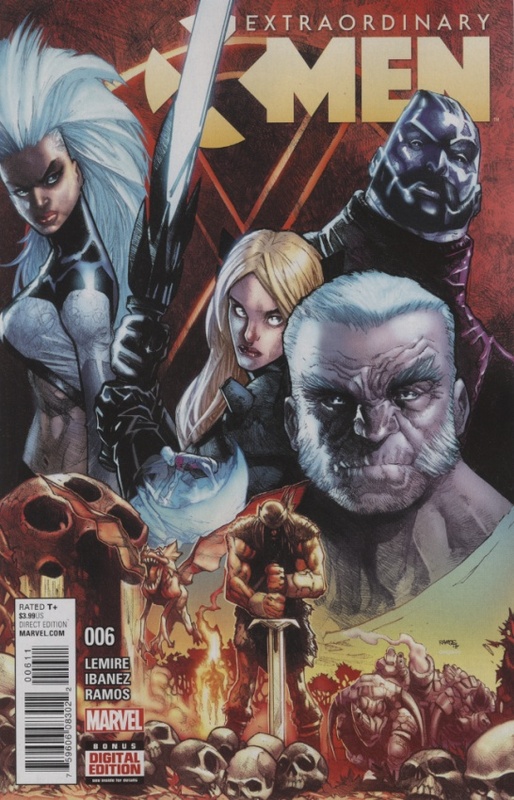 Who Wolverine was a teammate alongside with during his tenure on Uncanny Avengers. 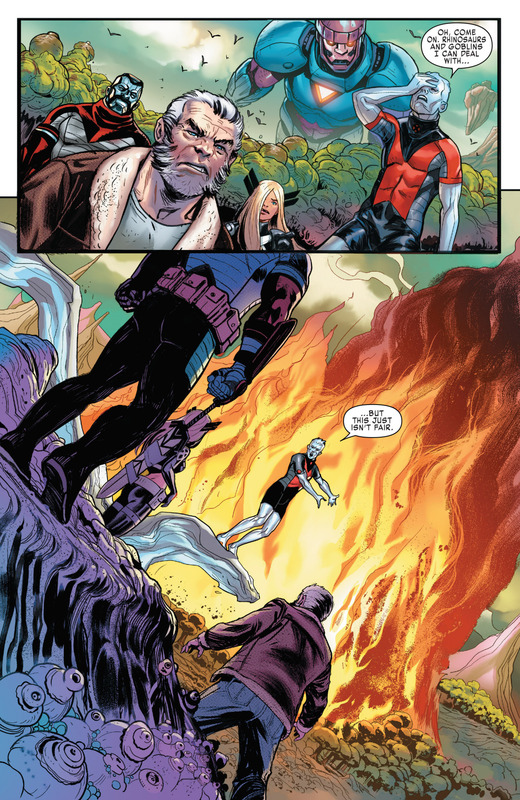 Storm pretty much tells Old Man Logan to kill Sunfire, if he steps out of line, he is to end Sunfire. Which seems cruel, as Old Man Logan is super worried about murdering mutants and downward spiraling into a murder train of mutants. Next issue’s cover hints at Nightcrawler crying – which makes me sad.